The need to reduce consumption of water in California is an urgent issue. Mandatory water restrictions are in place and full cooperation is necessary. How do we save our camellias? If you haven’t already done the following things do them as soon as possible. Check every outlet, faucet, valve and washer to insure you have no leaks inside or outside your house. Make a strong effort to limit the use of water inside your home in order to have water for your camellias. Numerous suggestions and recommendations have been circulated in newspapers, magazines and the internet. Adopt as many as possible. Remember to recirculate water when possible. For example my dog loves fresh water twice a day. Her bowl contains two cups of water so the remainder is used for plants not thrown down the sink. I have changed fish tank water once a week for 60 years so the tropical fish live for years. I now save and use the 20 gallons of water removed from nine tanks on plants. You t0o may have personal ways to save or recirculate water. A key is to have a rational plan. The typical lawn uses high amounts of water and in fact in many cases is overwatered. Install timers to limit application; water after the sun goes down so there is less evaporation loss — not in the early morning. Never use the “California rake”, that is, using a hose to clean walks, driveways and around the pool. Sweep leaves with a broom or have the gardeners do this for you. When washing the car, tools, tables, chairs use a pail of water and recirculate the water onto the lawn or use it to flush the toilet. When watering a shrub or tree it is best to do one deep watering rather than many small ones. Focus on saving your best plants. Keep the show winners and most needed landscape camellias. Let the “dogs die” including those with poor flowers or those struggling to survive. In short, cut your losses. Install a drip system and be sure it is operating correctly. Automatic systems are convenient and useful but will need to be monitored to insure they are working properly. Not infrequently, one plant or area gets too much moisture and another not enough. 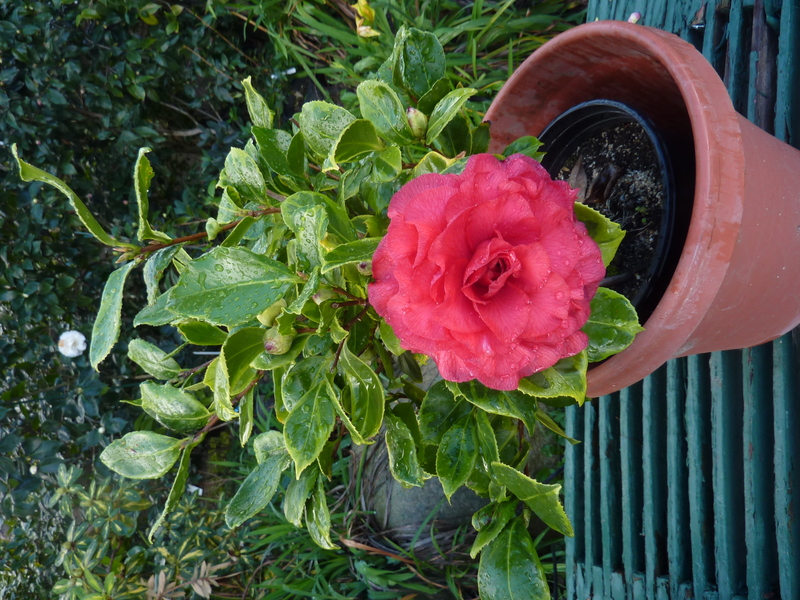 The camellias in pots should be potted up one size using moisture retentive soil (a little less sand or perlite and more light soil, bark or coarse peat moss). These larger containers can then be placed in an empty larger pot. The larger container will use less moisture and the second pot will help by insulating thereby reducing heat and assist in retention of moisture. When possible, plant your favorite cultivars in the ground. 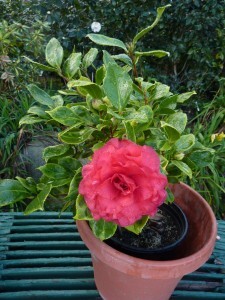 Camellias in the ground need less water than those grown in pots. After sundown spray the camellia foliage with a mist sprayer. This will delay the evaporation of moisture from the leaves. Prune your camellias drastically as a water saving strategy. With less leaf area there is less loss of moisture through transportation. This is best done in the spring to save water loss during the summer. In the winter when cutting blooms for the home or a show prune back stems thereby reducing foliage. Well established mature camellias are hardy and can survive with less moisture than younger plants or those in containers. Many older camellias have survived past droughts some even making it with only the rain provided naturally. In summary, make a home and garden water restriction plan which is in compliance with the mandatory restrictions and maintain the plan. Finally make water priorities which will sustain your best plants, especially your most valuable camellias.